Waterjet Filtration a Sign of a "Modern Machine Shop" | KLH Industries Inc.
KLH's waterjet cutting services are currently being featured in the November 2010 issue of Modern Machine Shop magazine. 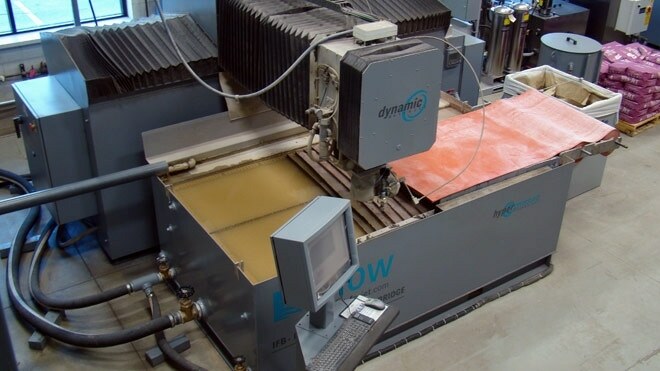 The article, "Water Conservation in Waterjet Machining," details the installation of an Ebbco water reclamation system. KLH first saw the water reclamation system at a trade show. It wasn’t being marketed at the booth where they saw it, at least not directly…Since the exhibition floor offered no practical way to send water down a drain, the water had to be contained. Not only has this system reduced water consumption by 95%, but also consumables, like orifices, are already seeing a substantial increase in life. Read the article in full in Modern Machine Shop magazine, or at www.mmsonline.com.